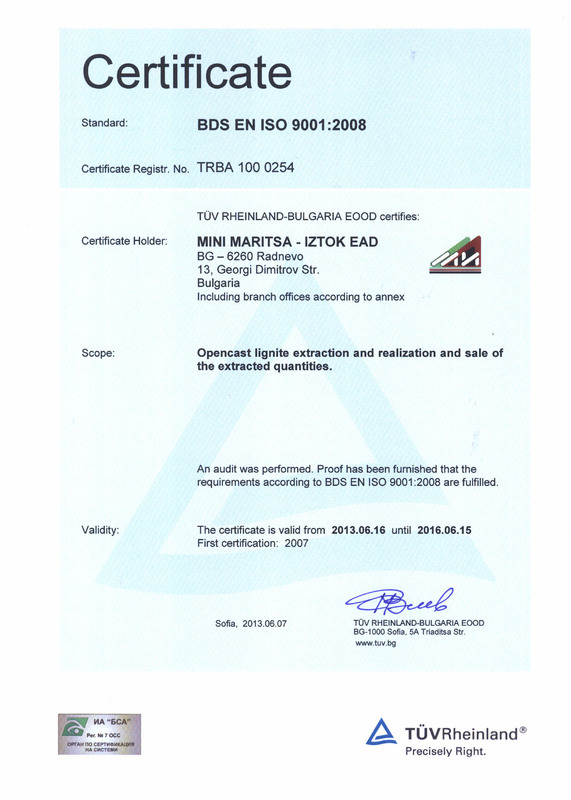 The development and implementation of Quality Management, Environmental Management and Occupational Health and Safety Management Systems at Mini Maritsa Iztok EAD commenced in 2006. The first certification of the Quality Management System took place on 31st July 2007, of the Occupational Health and Safety Management System – on 13th August 2007, and that of the Environmental Management System – on 21st January 2008. The work done over the years, the experience accumulated and the good practice applied made it necessary to integrate the three systems, thus an Integrated Quality Management, Environmental Management and Occupational Health and Safety Management System came into force in April 2009 in accordance with the following standards: BDS EN ISO 9001:2008, BDS EN ISO 14001:2005, BS OHSAS 18001:2007. 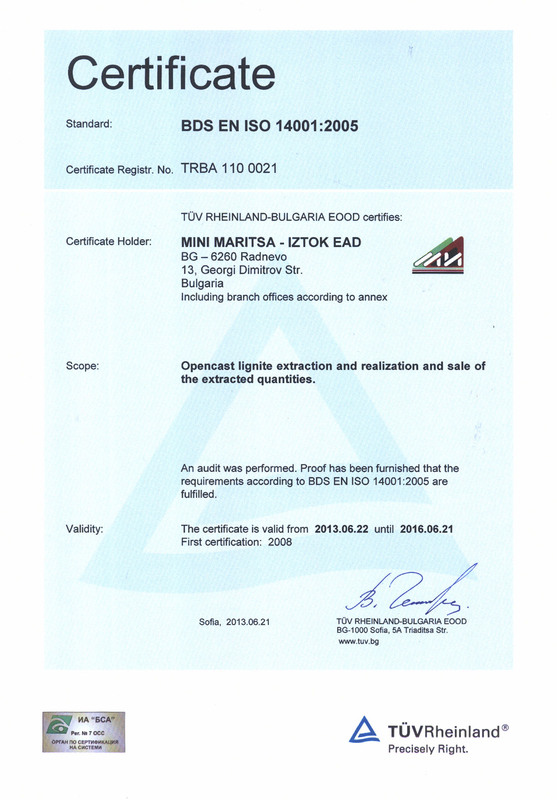 The certificates were successfully maintained in 2010 and 2013 during the re-certification audits, carried out by the Management Systems Certification Body under TÜV Rheinland Bulgaria EOOD. 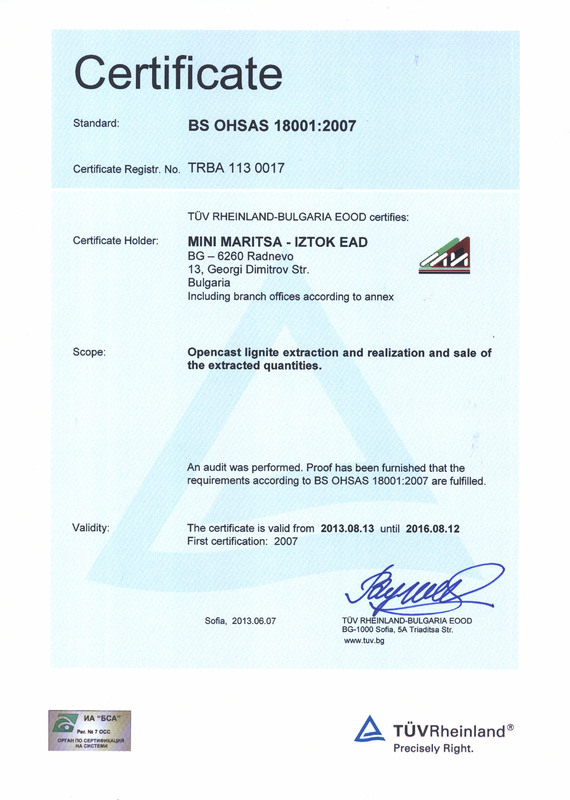 The certification is a proof of the efforts successfully made by Mini Maritsa Iztok EAD management team, workers and employees to improve the quality of the product offered and to meet the expectations and demands of our customers. Due to the continuous system improvement, a fifth version of the Integrated Management System documentation was approved in 2013. The processes covered by the management systems entirely encompass the main subject of activity of Mini Maritsa Iztok EAD: Opencast lignite mining and trading and sales of the lignite extracted. Ensuring the sustainable development of Mini Maritsa Iztok EAD based on satisfying the demands and expectations of the parties interested in the activity of the Company; continual improvement of the conditions for health and safety at work and permanent reduction of the adverse effect of mining activities on the environment.